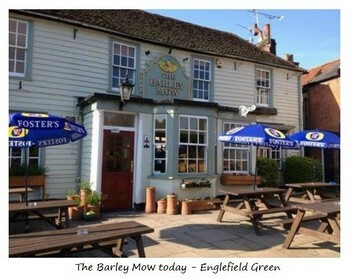 Jane Aikin's mother owns and manages the village public house, the Barley Mow. Jane is a bright girl and has been well educated at the parish school. The ladies on the Green believe Jane should become a governess or teacher, rather than continue working in the family business. Jane's cousin John is also in the home, a churlish lout - but adored and spoiled by the two women. Next door to the pub lives Mrs Mowbray, a poor but highly aristocratic old lady who patronises Jane, and has taught her ladylike manners. When old Mrs Mowbray learns that the schoolmaster is in love with Jane, she warmly adopts his cause. But will Jane accept this serious young man, or will her attachment to her ungrateful cousin carry the day? No one is prepared for the dramatic events which follow. Of the nine short stories in this series this is the only one not narrated by Mrs Mulgrave. Margaret Oliphant may have felt that Mrs Mulgrave would not have been interested in the doings at the local pub!